Sharon Jones & The Dap-Kings perform before Hall & Oates at the Darlings Waterfront Pavilion in Bangor on July 14, 2016. 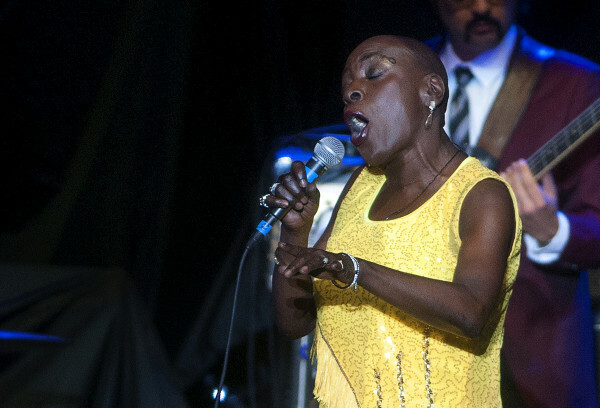 Sharon Jones, a late-blooming soul singer who emerged in her late 40s with a gale-force voice and a magnetic stage presence, and who kept performing for the past three years while being treated for cancer, died Nov. 18 at a hospital in Cooperstown, New York. She was 60. Her death was announced by a representative, Judy Miller Silverman. The cause was pancreatic cancer. Miss Jones, as she was always introduced in the dynamic stage shows with her backing band, the Dap-Kings, had a raw, unreconstructed singing style drawn straight from the heyday of soul music in the 1960s. She was born in James Brown’s hometown of Augusta, Georgia, and sang in church choirs and wedding bands in her youth. But as she tried and failed to launch a solo career, she found work as a dental assistant, armored-car guard and prison guard at New York’s Rikers Island. In spite of a voice that reminded critics of Aretha Franklin, Mavis Staples and Tina Turner, the diminutive Jones — barely 5 feet tall — was repeatedly passed over by producers and record labels. “They just looked at me and they didn’t like what they saw,” she told Rolling Stone magazine this year. She was finally discovered by Gabriel Roth, a musician who had a small Brooklyn record label, originally called Desco and later Daptone. Roth, who played bass and was the leader of the Dap-Kings, wrote many of Jones’ songs under the name Bosco Mann. The music was original, but the style was classic old-school soul. Jones stayed with Roth and the small Daptone label because she could sing the music she wanted. Jones toured throughout the country and, eventually, around the world. She did not have a Top 40 hit, but she was nominated for a Grammy Award in 2014, and her enthusiastic audiences sang along when she belted out such stirring tunes as “I’ll Still Be True,” “Nobody’s Baby,” “The Game Gets Old” and, perhaps her best-known song, “100 Days, 100 Nights,” which was featured in television commercials for Fitbit. After she was first treated for cancer in 2013, Jones transformed two sassy breakup songs, “Retreat!” and “Get Up and Get Out,” into spirited anthems about her plight. Even as she underwent chemotherapy and radiation treatment, losing her hair in the process, she returned to the stage as soon as possible. Sharon Lafaye Jones was born May 4, 1956, in Augusta, Georgia, and spent her childhood in North Augusta, South Carolina. She moved in her early teens to Brooklyn, where her mother went, fleeing an abusive husband. Jones sang in church from childhood and later worked in wedding bands and as a backup singer. She went through a variety of jobs, including as a prison guard and filling ATMs with money while working for an armored car company. Her survivors include four brothers and sisters. Kopple’s documentary shows Jones at the height of her career and at her lowest, when she learned in 2015 that her cancer had returned. She insisted on maintaining a steady touring schedule, even as she underwent chemotherapy. Backstage, she often was in pain and barely able to move. But when the long, rousing introduction reached the words, “Miss Sharon Jones!” she found the energy and bounded onstage, with a full voice and soul.